We live on a small property in the middle of several much larger parcels and one of the benefits of being out here in the country is that the gentleman who farms the land next door gives us a couple bushels of peanuts out of each crop in return for keeping an eye on his equipment for him. Raw peanuts can be frozen indefinitely (green peanuts, fresh out of the ground must be allowed to dry first) so we let the kids help shell them all and store them in the freezer in bags until we’re ready to use them. This year’s crop is just about ready to be harvested (here are my five year old quads and six year old son standing in the field) so we used up the last we had in the freezer to make these yummy honey roasted peanuts. Preheat oven to 350 degrees. Mix honey, butter and optional salt in a saucepan, heat on low and stir until well blended. This step can also be done in the microwave if you prefer. 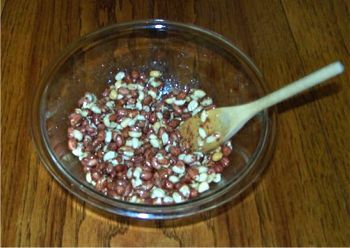 Pour glaze mixture over peanuts in a large bowl and toss until coated. 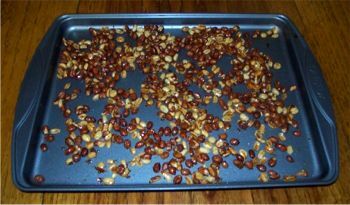 Bake the peanuts on a cookie sheet at 350 degrees for 5 to 10 minutes, stirring often. Peanuts are done when they turn golden brown and the glaze becomes thick and darkens. 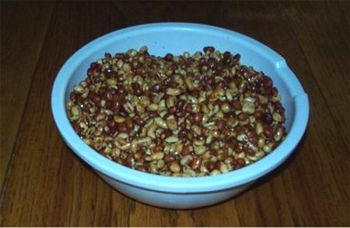 Allow to cool while continuing to stir the peanuts for an additional 5 minutes to keep them from sticking together. Serve while warm and store the remainder in an air tight container. I love this! 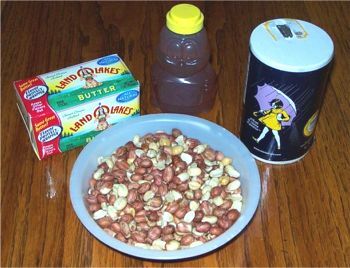 I made BBQ peanuts a few years back as Christmas gifts for the men in my office. It was a hit! BBQ?. Could you give me the recipe?. 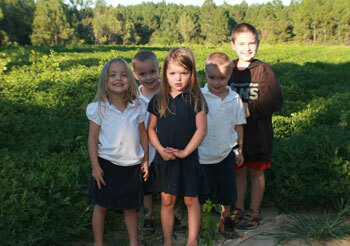 How fun that you get bushels of raw peanuts! These look delicious. Up here in the North, buying raw peanuts costs an arm and a leg. So, I doubt I’ll be trying this anytime soon. But I wish I could!